We are most aware of the need to focus on solutions and social system change but sustainable relationships are equally or perhaps more important. To achieve such relationships, some of us need to learn how to facilitate and be elders who know and participate in with the various sides, and various roles, inside of themselves and outside in group process. Such elders can turn conflict into fluid and creative relationships where people understand and work together. 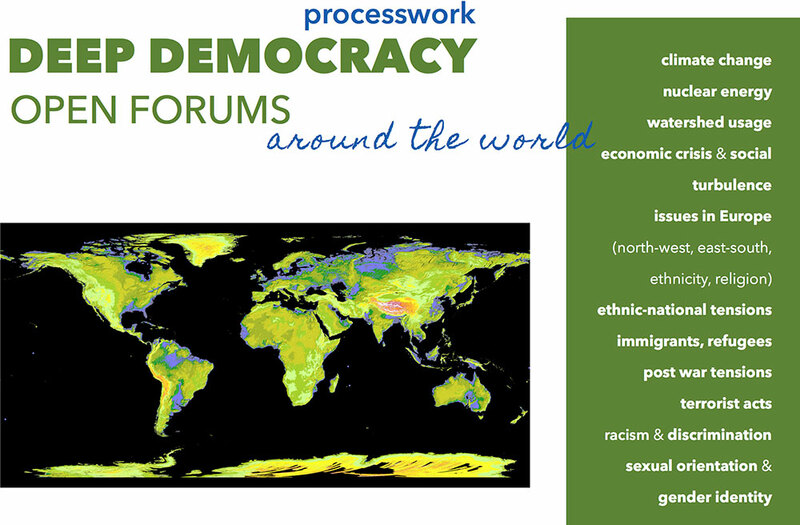 Deep Democracy Open Forums are facilitated discussion forums for issues that concern everyone to be publicly discussed. They aim at forwarding public dialogue and addressing issues of public concern that create polarisation, such as socioeconomic issues, issues of race, religion, immigration, gender, sexual orientation, fear or hatred of other (xenophobia, islamophobia, homophobia, anti-semitism), ethnic and national tensions, discrimination, relations between institutions and communities, etc., and at building community by bringing together a diversity of people and points of view. Open Forums address the need for relationship between people who belong to opposing sides of an issue, by promoting awareness and understanding of the experience of the other, and in this way reducing animosity. In an Open Forum space is created for listening, agreeing and disagreeing with other viewpoints, and for fostering awareness of the deepest feelings in such a way, as to create direct non-violent interactions. The key is awareness of the flow of events and communication signals. Noticing subtlest of signals indicating the onset of emotions such as fear, anger, hopelessness, and other altered states, and using them to bring awareness to the feeling experiences in the background, can transform seemingly impossible problems into community building experiences. The focus of the facilitator is on awareness – helping the world know itself – rather than pushing for change, and noticing what arises from that awareness and the interconnection it creates. 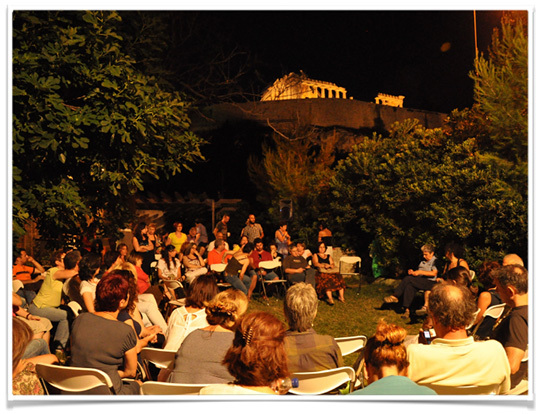 The facilitation of the Open Forum is based on the idea of Deep Democracy, a special feeling of belief in the inherent importance of all parts of ourselves, all viewpoints in the world around us, and all dimensions of our experiences. Deep Democracy adds the feeling and relationship dimension to democracy, going beyond power. Deep Democracy is the philosophical basis of the Processwork paradigm. Processwork, or Process-oriented Psychology, developed by Dr. Anrold Mindell, is an evolving, trans-disciplinary approach supporting individuals, relationships, groups and communities. In the beginning two or three speakers with differing viewpoints to briefly present their view for three to five minutes. The floor is then opened to a facilitated public discussion that encourages dialogue and interaction for an hour and a half or two hours. Discussion and networking in smaller groups follows for another twenty minutes. Closing in the networking groups or coming all together to hear from the small groups and summarise. How can we get along with the people with whom we differ and disagree? How can we open a deeper level of discourse that allows for dissent and community building? How can we engage in dialogue with a diversity of opinions and points of view, listen, agree, and disagree, relate, become aware of, and understand one another’s experience? We can only be against what we do not know and have no or little personal experience with. 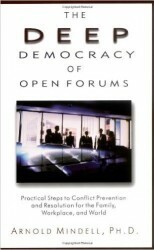 For more on Open Forums see Arnold Mindell’s book, The Deep Democracy of Open Forums: Practical Steps to Conflict Prevention and Resolution for the Family, Workplace and World.